Ginny hurried into Harry&apos;s house without knocking and yelled his name. She was hysterical and had the Daily Prophet with her. Harry appeared in the kitchen and had his wand with him. But when he saw that Ginny was okay he put it away. " Ginny scream like that again and whole London will wake up!" Ginny took a deep breath and tried to stay calm. " Sorry. But you have to read this, it&apos;s awful!" Ginny gave him the Daily Prophet. Harry was startled when he saw the first page. &apos; Here dies the former death eater&apos;? Harry read out loud. Ginny nodded and put her hand over her mouth.
" Read it" She begged. Harry opened up the page and read it.
" It is confirmed that Draco Lucius Malfoy, the former death eater, yesterday was found dead in a hotelroom  in Rome in Italy..."
" Keep on reading" Ginny said.
" The cause of dead is the Unforgivable Curse, Avada Kedavra, and there is no sight of the killer. Some Aurors are still investigating the case"
" Oh my god.." Ginny breathed.
" Blaise is going to flip" Harry said.
" And what about Hermione? She&apos;s going to get herself broken "
" I&apos;ll talk to her " Harry said.
" Good, I&apos;ll try to explain this to Blaise. Oh Merlin&apos;s beard Harry how did this happen?" Ginny threw herself around Harry&apos;s neck and sobbed.
" I don&apos;t know Ginny. But Draco&apos;s parents will have a funeral to arrange "
Hermione flew up from the bed and felt herself sweating and breathing heavily. She felt hot salt tears falling down her cheeks. She thanked the stars it was just all a dream.
" Oh Draco..." She cried. When she couldn&apos;t fall back to sleep she went up and walked around the big manor. Watching some portraits and found some new books in the library. She walked over to a window and looked at the big garden outside. 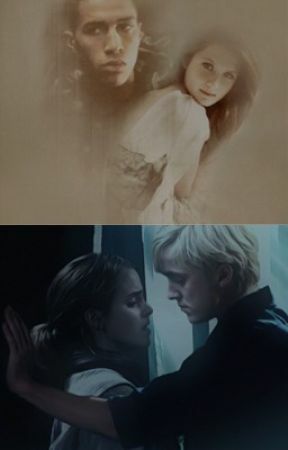 She could almost feel Draco by her side, his hands resting on her shoulders. His breath tickling her skin, his lips on hers. It had been two months now since he left.
" I wish you were here, Draco"
Just after those words, everything went black and she felt herself fainting. In her head she heard six words she knew was from Draco.
" I wish you were here too"